We invite you to Register Your Interest in playing Women’s Football at St Mary’s Salesian Amateur Football Club in season 2019. Our club is a very good fit for anyone looking to play Women’s football in 2019. Come and play at the highest level. We will be fielding two women’s teams in 2019 (Seniors and Reserves) who will compete at the highest level in William Buck Premier A, backed up with a thirds team which means all our players are able to play at a level that best suits them. Our players range from those who have played before to those who are new to the game. We have two very experienced coaches, Damian Sutherland and Simon Brownhill, and their coaching philosophy highlights both skills development and fitness. We encourage each player to develop and to strive to be the best they can, no matter their skill level. We are one of the largest women’s clubs in the VAFA and one of the few clubs fielding two women’s teams in 2019 (Seniors and Reserves), backed up with a thirds team. This means all our players are able to play at a level that best suits them and it ensures that you will get a game each week. Our Women’s Senior Team has won back-to-back Premierships in 2017 and 20187, and our Women’s Reserves made the Preliminary Final in 2018. Our three women’s teams train together on Mondays and Thursdays. To all new players, please just come along and introduce yourself and you will be made very welcome. After Thursday training this, its back to Ferndale Park for the shared player dinner and all the team announcements. Please feel free to email the club on secretary@stmaryssalesianafc.com.au with any questions or for any more information. We are recruiting for season 2019 – all new players are welcome! 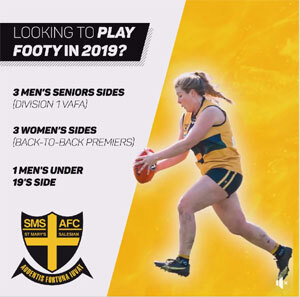 We invite you to Register Your Interest in playing Women’s Football at St Mary’s Salesian Amateur Football Club in season 2019.